Organize your Lego’s by color, size, set. Build and display creations with base plate top. Keep your instruction manuals and building base plates in one place. Store bricks, minifigures, sets and other accessories and play materials. Each project case has in-molded Lego labels. Includes two building base plates. Play and put away workstation – take unit out to build and store away when finished. Workstation, storage and display unit all in one – creative play chest. Includes two building base plates. Building base plates fit on top of unit and inside portable project cases. Raised edges of top keep base plate secure for building or displaying creations. Portable project cases serve as filing system for sets or grab ‘n go solution. The Guanli Military Cub climbing vertical from a very short take off! Electric RC Car drive by fast. Back in October pre-orders became available for Cu-Poche Kuroneko. Many of us were pleased with the stock factory images of her, but AmiAmi’s English blog did a review of their own with some pretty nice photos to compliment the originals. I found the review pretty amusing and suggest you go check it out. Personally I preferred the stock images to the newer ones because they seem to express a more subtle side of Kuroneko’s personality, not that they are bad per say. Also the reds of the background do not feel like they suit her personality as well as another color might. As a whole I think that Kuroneko makes for a great addition to the Cu-Poche line. Her outfit does a nice job covering up joints on this poseable figure and if you check out both galleries you will see that there is indeed a wide range of expressions you can give her. Better yet she comes with a Cu-Poche scale full sized mirror so she can admire her own expression in it! A pretty girl in little more than a button-down top is one of life’s simple pleasures, and that’s just what we’re getting from Chara-Ani. Blasphemy it may be, I’ve never been a huge Index fan despite having partaken of a fair bit of the material. Because of this, I’ve never dabbled in Railgun, meaning I’ve missed this particular character. From what I can briefly infer she seems like my kind of lady though, and despite this figure’s simplicity it certainly appears worth a look. Again, it may be a less than complex figure, but it isn’t lacking in appeal at all. Ruiko’s got a super cute smile, and the top shows off her figure wonderfully. Plus of course it ends at just the right spot, leaving little to the imagination! She’s not too bank breaking either, with a March release setting you back about ¥8,000. There aren’t too many Raildex characters I give more than a once over, but I’ll certainly be keeping an eye on Rui here. Thor is the sworn protector of both Earth and Asgard. With his hammer Mjolnir in his hand there is nothing that can stand in his way! Even the very toughest opponents are no match for you and your Thor figure! When enemies approach, press this 10-inch electronic figure’s belt to unleash his defiant phrases, like “Have at thee!” and “My hammer strikes true!” If the villains haven’t fled already, pull his arm back and send his mighty hammer flying in their direction. With that kind of firepower and your figure’s mighty muscles, you’re sure to win the fight! Marvel products are produced by Hasbro under license from Marvel Characters B.V. This rainbow-colored gear toy is twisting, turning, changing fun! With their bulky, notched shape, the colorful gears are easy for children to fit onto the color-coordinated pegs . . . then rotate, remove and rearrange. Toddlers will be fascinated by the colors, movement and sweet butterfly artwork on this charming toy. Solid-wood gear board features appealing butterfly illustrations. D & E engine power at its finest! Powered by a D12-3, E9-4 or an E9-6, the Maxi Alpha 3 can reach heights of 700 feet! That is pretty amazing for a rocket that weighs over 6 ounces yet is fairly simple to build. It might take an afternoon of your time but then it is off to the flying field to have some fun! Engines, wadding, launch pad and controller not included. Get set for action at the Lion CHI Temple, a buildable fortress complete with vehicles and hidden traps. This amazing model will engage children 8 to 14 years of age with its fantastic look and assortment of accessories and minifigures. The Crocodiles and the Lions are ready for their final showdown at the Lion CHI Temple. Launch the flick missiles and unleash the claw bikes to stop Cragger and his Reptile Raider. Loads of special features make this fun to build and even more fun to play with! With a huge CHI orb, hidden traps, and awesome lion gate, there’s plenty of adventure to be had at the Lion CHI Temple. This set comes complete with minifigures of Lagravis, Laval, Longtooth, Ewald, Cragger, Crawley and Razar. Have Lagravis guard the CHI orb while Longtooth mans the tower cannon. Laval takes the lion claw bike into the fight against Cragger and Crawley. 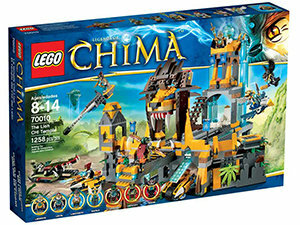 Collect all the LEGO Chima sets to stage the struggle for CHI. 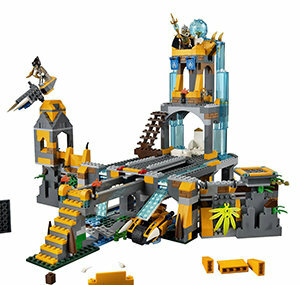 LEGO Chima sets are compatible with all other LEGO System sets. Cragger is trying to break into the Lion CHI Temple – slam the gate shut and send him falling into the pit. Fire the rotating tower cannon and send up the Eagle fighter to stop the Ravens’ aerial assault. Then use the Lion claw bikes to drive the reptiles back. Accessories include four CHI weapons and three standard weapons. Get ready to do battle for the fate of all of Chima! An epic battle for the CHI has begun at the majestic Lion CHI Temple. Cragger, Crawley and Razar are battling for their tribes and trying to reach the sacred CHI orb rising high above the temple. Help the Lion and Eagle tribes to fight everyone off and restore balance to Chima once again! Slam the lion gate shut and send Cragger plummeting into the pit. Then release the hidden lion claw bikes to intercept Crawley’s reptile raider. Deploy the agile eagle drone fighter to repel Razar’s airborne assault or aim and fire the rotating tower cannon. Includes 7 minifigures with weapons: Lagravis, Laval, Longtooth, Ewald, Cragger, Crawley and Razar. Syma introduces the newest Syma S800G Helicopter that is head and shoulder above its previous micro predecessor. Completely new design, flight characteristics, the S800G combines the durability of the S107G, as well as the flight characteristics of a hobby graded product. This is the perfect step up from a micro 3 Channel helicopter. The S800G’s flight is controlled by the swash plate, which allows greater maneuverability. It allows faster forward and backward movement, as well as side to side flight movement. This is considered as a beginner friendly/intermediate level helicopter. If you enjoy previous generation Syma, the S800G would blow it all away! 4 Channel Remote Control Helicopter with Bonus Parts! Manufacturer Recomended Age: 12 years and up.